PhilSHIFT an interdisciplinary group of researchers from the University of the Philippines (UP) and Ludwig Maximillian University Munich (LMU) that aims to study the Filipino body clock and shift work. PhilSHIFT intends to pursue projects in human chronobiology and shift work that will contribute to health promotion and policy development for productive and sustainable work. 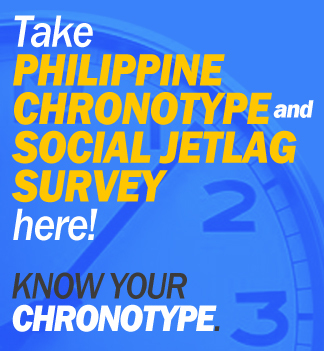 Its ongoing projects concern the chronotype of Filipinos and sociat jetlag. Chronotype reflects how one's individual body clock ticks and fits into the 24-hour day. It has characteristics that are both inherited and influenced by your daily light exposure. Individuals differ in their "phase of entrainment" - that is, relationship between internal, biological time and the external time we keep (e.g. the 24-hour organization of a day or our daily life routines). This explains why there are different chronotypes. Social jetlag is the phenomenon experienced when our internal, biological time is different from our external time (the 24-hour day or how our daily routines are organized). The College of Public Health of the University of the Philippines Manila announces the upcoming public lecture "Human Chronobiology: internal time, social jetlag, and health" on Wednesday, September 21st, 3 to 5 PM. It will be held at the CPH Auditorium at 625 Pedro Gil St., Ermita, Manila, Philippines.